Sign up today to be a part of this fun family event! 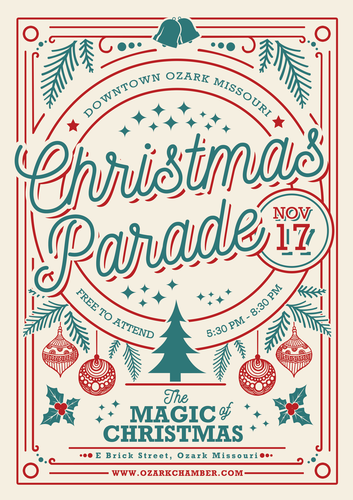 This year's parade theme is "The MAGIC of Christmas." Celebrate Christmas with your family, colleagues, or team of volunteers and create your one-of-a-kind themed float, vehicle, or equine entry for the 2018 Christmas Parade. This event is held in the evening to highlight the sparkle of the holidays. The 2018 parade falls on Saturday, Nov. 17, and begins at 5:30 pm. The parade is held each year on the Saturday before Thanksgiving. Parade registration cost is $40 per entry for floats/marchers and $20 for equines. Car clubs may enter up to 5 vehicles for $40 and add cars at $5 per car after the initial registration. School marching bands may enter at no cost. Please email events@ozarkchamber.com to register a marching band. Participants must register by Friday, Nov. 9, in order to be judged in the parade. To register, click REGISTER NOW on this page, call the Ozark Chamber at 417-581-6139, or email events@ozarkchamber.com. You may also register in person at our office -- 1471 W. South St. in Ozark, MO. REQUIRED: Participants must download the 2018 Participant Guidelines and Instructions for complete details. SPECTATORS: The route begins at Ozark Bank on Jackson Street and proceeds down Jackson to 3rd Street. The route turns onto the Historic Downtown Square at Church Street to complete a loop and return to 3rd Street. PARTICIPANTS: Turn at U.S. Automotive on Jackson St. to line up behind SLS (the old FASCO building) -- 1700 W. Jackson, east of the Hwy 65/Jackson intersection. Volunteers will guide you to your position. Be prepared to STOP, give your information, and receive an instructional packet. Line-up will take place in the large parking lot behind the SLS building. Parade entries may be made by individuals, businesses, organizations, or other groups.